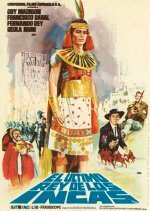 Legacy of the Incas  [DVD] aka Viva Gringo! Quality: Digital, w/s 2.35:1, Colour. Also known as Viva Gringo! In Peru, the land of the Incas, the Indian pin their hopes on Jaucarapora. They want to him as their king who could drive back the white conquistador. A stranger appears in Lima who risks his life to rescue the president from a charging wildcat. This Jaguar is accused of the two Incas' murder. The president gives him four weeks to prove his innocence. No matter where the Jaguar goes, the craftily circulated news that he is a wanted killer is always there ahead of him. Graciela, his dead brother's daughter, sets out alone to forewarn him. The Jaguar finds out that Gambusino has killed his brother and Jinaucarapora's father. Jaucarapora meets Graciela and saves her life. They fall in love with each other. Gambusino tries to kill the Jaguar but perishes himself. Graciela persuades Jaucarapora that an uprising against the incomparably stronger whites will ruin his people for good. He rejects the sacred crown. The last Inca suffers death at the hands of his own mentor. ~ from IMDB.